MANSFIELD, Mass. – It’s happened in different innings, and it’s happened in different ways. But one painful constant for Mansfield has been one letdown inning. Unfortunately for Hornets, that inning was the top of the sixth against 13th-seeded Wellesley, as the Raiders scored all three of their runs and recorded a 3-2 decision over fourth-seeded Mansfield. Wellesley had just two hits through the first five innings of play but plated three runs on their third hit of the game in the top of the sixth. With Mansfield holding a 1-0 lead, Wellesley junior John Ciolfi led off with a walk and moved to second when Brendan Dolan reached after his sacrifice bunt was mishandled for an error. Sophomore Henry Weycker (Wellesley’s pitcher) launched a two-run double into right center field to put the Raiders ahead. A ground out move Weycker to third and before Mansfield senior Nolan Dousa could deliver his next pitch on a 1-2 count, the infield umpire saw something no one else in the park did — a balk. That brought Wellesley’s third run in. 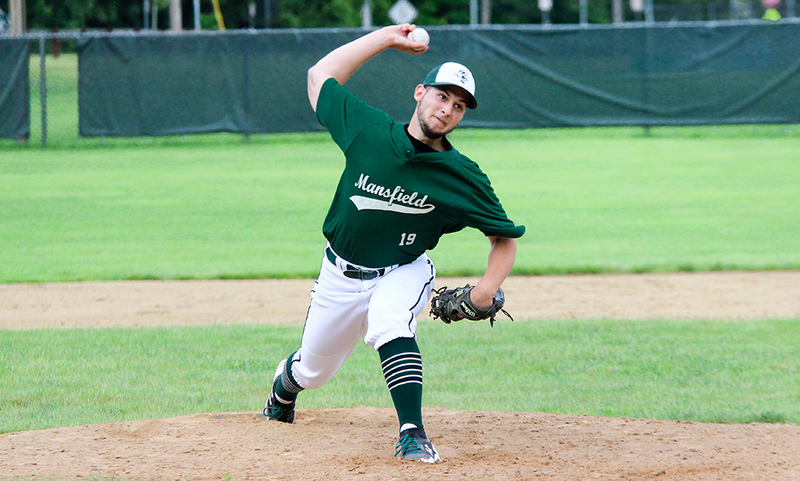 “All season long, our worst games, they have stemmed from one inning,” said Mansfield head coach Joe Breen. “Whether its the first inning, or giving up a couple late or just one single play. When you get to this level of baseball and playing teams like Wellesley, you don’t have room for many errors. We made a couple of errors, made a couple of mistakes and they took advantage of them. That was the difference in the ball game. Both teams put a pair of runners on in the first inning, but neither side could push across a run. Ciofli led off with a walk and went to second on a sacrifice bunt. Freshman Max Zajec drew a two-out walk to put runners on first and second but Dousa (CG, four hits, three talks, three strikeouts) got a fly ball to right field. In the bottom half, senior Max Boen led off with a walk and classmate Matt Farragher (two hits) followed with an infield single. But Wellesley quickly picked up two outs with a pick off at second and then catching Farragher at second with a pick off move. Dousa recorded a pair of strikeouts in the second in a 1-2-3 inning. Colin Gibbons led off with a single, moved to second on a sac bunt from Zack Peterson and took third on a groundout. However, Weycker induced a ground ball to shortstop Isaac Weycker and his throw just beat the runner at first. “Dousa is the biggest gamer that I’ve ever coached,” Breen said. “I’m glad I had the opportunity to coach him and I’m glad that a lot of the younger pitchers in the program got to watch him come back this year from a pretty bad injury and work through all of it and come out and compete. Our team is very different with Nolan Dousa on the mound and our guys want to win almost a little bit more than normal when he’s out there because of how much effort he’s put in. After another 1-2-3 inning from Dousa, the Hornets broke through for the first run of the game in the bottom of the third. Anthony DeGirolamo ripped a one-out line drive double and moved to third on a ground out. DeGirolamo then came home to score on a wild pitch, giving Mansfield a 1-0 lead. Mansfield put another runner in scoring position in the bottom of the fifth inning as DeGirolamo walked and stole second, but Wellesley picked up the third out via a grounder to second. After the Raiders took the lead in the top of the sixth, the Hornets were able to get one run back in the bottom of the inning. Gibbons reached on an error and pinch runner Connor Driscoll took third after an errant pickoff attempt. Peterson delivered with a hit up the middle to make it 3-2. In the bottom of the seventh, Kevin Dow reached with one out on an error but Weycker got a strikeout looking and induced another grounder to second for the final out. Mansfield baseball finishes the season 14-8. Canton, 10 @ Cohasset, 4 – Final – Robbie Wilkinson went six innings to pick up the win and improve to 3-1 on the season. Canton supported Wilkinson with 15 hits, including a 4-for-5 day for junior Matt Casamento who scored two runs and drove in two others. Senior Danny Hartnett went 2-for-4 with three runs and two RBI, senior Kevin Monagle went 3-for-5 with two RBI and freshman Nate Quan went 2-for-3 with an RBI for the Bulldogs. Mansfield, 4 vs. Bridgewater-Raynham, 0 – Final – Mansfield senior Nolan Dousa tossed a complete game shutout, scattering six hits and two walks while striking out six batters. Sophomore Dan Saraceno stepped up at the plate for the Hornets, going 3-for-3 while knocking in two runs. Mansfield scored three runs in the third inning and added one more in the fourth inning. Zack Peterson added an RBI for Mansfield. Sharon, 3 @ Canton, 0 – Final – Click here for a recap of this game. Mansfield, 12 @ Oliver Ames, 4 – Final – Mansfield got off to a great start in the first inning with five runs. Mady Bendanillo, Liz Mackin, and Mackenzie Burke each drove in runs with base hits and Sarah Cahill and Sarah Bradley each drew bases loaded walks for RBI. Megan Letendre had three hits for the Hornets, Bendanillo went 2-for-4 with a two-run homer, and Marissa Staffier, Burke, and Mackin each had two hits. North Attleboro, 14 vs. Old Rochester, 2 – Final – North Attleboro senior Zach McGowan scored four goals and added two assists, recording his 200th career point. Colin Young also added four goals and Jack Dakin notched three goals and one assist. King Philip, 6 @ Franklin, 18 – Final – Franklin led by just three (7-4) at halftime but pulled away with a dominant second half to beat KP. Caroline Lounsbury had four goals and three assists, Annie Walsh added five goals and two assists and and Jordan Jette finished with two goals and three assists. FHS head coach Kristin Igoe Guarino said Grace MacCallum and Annie Walsh did well on the draw, combining for 15 draw controls. Freshman Gianna Cameron made eight saves in net for the Panthers. North Attleboro, 19 @ Old Rochester, 10 – Final – Kenzi Rosenberg scored seven goals and had three assists and Erin Holley scored six goals, as North closed the regular season with five wins in the last six games. Katie Lindstrom had three assists for North, while Julia Dakin, Camille Pizarro, and Chloe Olsen each had two helpers. King Philip, 8 @ Attleboro, 0 – Final – King Philip broke open a close game with six runs in the seventh inning to pick up a win on the road at Attleboro. The Warriors took the lead with two runs in the second inning but didn’t breakthrough again until the top of the seventh. In the top of the second, Ryan Coulter singled, stole second and then scored on a base hit from Chris Wing. Wing came across to score on a double by Patrick Limerick. Wing got the win on the mound for the Warriors, tossing a complete game with six hits allowed. The senior struck out eight batters in the win. In the seventh inning, Will Weir tripled in Kyle Guenthner, Weir came across on a single from Ben Furfari, Collin Cooke knocked in Furfari with a base hit and Jack Webster and Cooke scored on a double from Wing. Attleboro’s Tyler McGovern tossed five solid innings for the Bombardiers with two runs allowed. North Attleboro, 11 @ Canton, 2 – Final – North Attleboro scored a pair of runs in each of the second and third innings and really created separation with a five-run fifth inning. Big Red added single runs in the sixth and seventh innings. Junior Nick Sinacola had a standout performance, both at the plate and on the mound for the Rockteers. He tossed six innings, scattering five hits with just one walk allowed while striking out eight. At the plate, Sinacola went 3-for-3 with a pair of doubles, a triple, a run scored and three RBI. Kyle McCarthy added two hits, two runs and two RBI, John Brennan had a pair of hits and Zach DeMattio hit a solo home run. Oliver Ames, 0 @ Franklin, 1 – Final – Franklin emerged from a pitcher’s duel with a 1-0 win, scoring the lone run in the bottom of the sixth inning. Franklin lefty Jason Ulrickson went the distance, tossing a complete game shutout with just four hits allowed. He walked just one batter while striking out three. Ulrickson also had a solid day at the plate, going 2-for-3. Oliver Ames sophomore Tom Parker also had a strong performance, going five-plus innings with just three hits against and two walks. The sophomore struck out a pair while allowing just the one. Franklin senior Ryan Hodgkins scored the lone run of the game, coming home on a sacrifice fly to right field from Josh Macchi. The Panthers had a strong game defensively, led by sophomore shortstop Alex Haba, who had eight putouts. Mansfield, 0 @ Taunton, 2 – Final – Junior Tyler Medeiros shined in his first start of the season, striking out four while allowing just three hits and one walk in six scoreless innings. Trevor Pietrzyk and Danny Keogh (save) combined for a scoreless seventh inning to close the game. Taunton junior Joe Manchester singled in the fourth inning and came around to score after an errant pickoff attempt and a misplay in the outfield. Taunton tacked on a second run in the fifth. Billy Emerson singled, advanced to second on a sacrifice by David Schofield, advanced to third on a single from Matt Machado and scored on a single to left field from junior Jacob Crawford. “Tyler threw the ball exceptionally well today,” said first year head coach Blair Bourque. “He threw strikes and let his defense make plays for him. After the first inning he really settled in. He was mixing his pitches up and hitting corners.” Mansfield’s Nolan Dousa struck out six in six innings of work, scattering six hits. Max Boen had two hits for Mansfield. Milford, 0 @ Stoughton, 15 – Final (5 inn.) – For the second time in three games, Stoughton’s offense has reached double figures in hits and runs scored. The Black Knights belted 16 hits while coming across to score 15 runs. 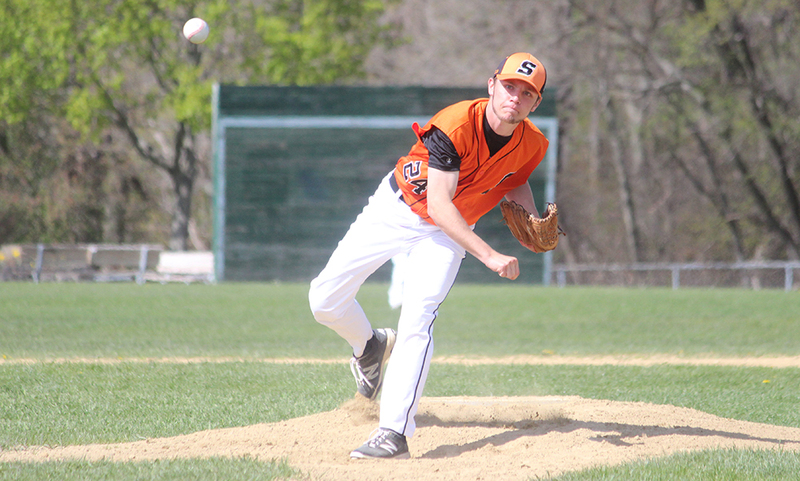 Stoughton senior Justin Hutchinson (3-for-4 at the plate with a double, two runs and an RBI) got the win on the mound, tossing four shutout innings with just two hits and one walk allowed, all while striking out seven batters. Sophomore Evan Gibb (2-for-3, three RBI, run) tossed a scoreless 1-2-3 fifth inning with a pair of strikeouts. Also hitting well for the Black Knights were Ruben Gonzalez (3-for-4, three runs, RBI, three stolen bases), Jack Connelly (2-for-2, double, home run, three runs, three RBI), Pat Hagerty (2-for-3, triple, RBI, three runs), Nick Hardy (2-for-3, double, run, two RBI), Matt Hadley (triple) and Ryan Sullivan (run, RBI). Canton, 0 @ North Attleboro, 21 – Final (5 inn.) – Bella Erti was perfect through five innings to pick up the victory for North Attleboro, striking out five of the 15 hitters she faced. Olivia Capobianco went 4-for-5 and Liz Morehouse went 3-for-4 for North. Also for the Rocketeers, Meg Barlow, Amelia Murphy (3-for-3 on the day), and Stephanie Inglese each had two-run homers. Franklin, 13 @ Oliver Ames, 2 – Final – Franklin turned a 2-0 deficit into a big lead, plating 10 runs in the fourth inning and then adding three more runs in the sixth inning. Ally Shea had a hit and knocked in two runs for the Panthers while Meg Caron and Olivia Haba each knocked in three runs. Sophomore Emily Valentino tossed a complete game, striking out one to earn her first varsity win. Taunton, 5 @ Mansfield, 0 – Final – Courtney Fisher went the distance for the Tigers, tossing a three-hit shutout with six strikeouts. Hannah Aldrich went 2-for-3 at the plate and scored a pair of runs for Taunton, while Jaime Brown had a pair of hits and Kya Enos drove in a pair of runs. Sarah Cahill made her first varsity start for the Hornets and went five innings, allowing just five hits. Stoughton, 2 @ Milford, 10 – Final – The Scarlet Hawks broke the game open with a five-run third inning, turning a one-run deficit into a lead. Jess Tomaso (3-for-4, double, six RBI) had a three-run homer run and three batters later, Kelley Reichert (2-for-4) had a two run single to put Milford up 5-1. Shannon Cormier drew three walks and came around to score each time for Milford. Reichert got the win in the circle, tossing a complete game with five strikeouts. Canton, 6 @ Scituate, 12 – Final – The Bulldogs finally played their first game of the season, but fell on the road to a tough Scituate team. Sophomore Mike Shaw led the Bulldogs with three goals and one assist while Kevin Albert added three asses. Ryan Lodge scored a pair of goals, Dan Cohen netted one tally and Nick Allen chipped in with two assists. Freshman Jack Connolly played with in goal in his first varsity game, making 12 saves. King Philip, 8 @ Bishop Feehan, 7 – Final – King Philip overcame a plethora of penalties to edge out Bishop Feehan. The Warriors were down a man for over 16 minutes in the game but a great defensive effort and a stellar performance from Paul Macrina in goal helped KP hang on. Macrina made 16 saves in net while first year head coach Jamie Stefanini said Michael Curtain, Connor Khung, Zach D’Amico (goal), Wes Bishop and Garrett Maxwell all played outstanding. John DeLuca scored a pair of goals for KP while Tim Watson had one goal and two assists, Colin DeVellis had one goal and one assist and Ben Palmer and Robert Tartagulla each scored once. Oliver Ames, 4 @ Silver Lake, 5 – Final – Oliver Ames shut out Silver Lake in the fourth quarter and scored three unanswered goals but fell just shy of completing its comeback against the Lakers. Senior Liam Brown, juniors Owen Gallagher and Eric LeBlanc and freshman Shane Kikelly each scored once for OA. Foxboro, 7 @ Walpole, 8 – Final – Sophia DiCenso and Caroline Boudreau each scored hat tricks for the Warriors and Meghan Curran added one. Freshman goalie Sara Addeche made six saves, as Foxboro held the defending Div. 2 state champions scoreless in the second half. North Attleboro, 8 @ Mansfield, 4 – Final – Katie Lindstrom, Erin Holley and Kenzie Rosenberg each scored two goals for the Rocketeers and goalie Kayla Moulin made 12 saves in the win. Oliver Ames, 7 @ Whitman-Hanson, 9 – Final – Emalyn Duvall recorded a hat trick and Sofia Masciarelli found the back of the net twice but the Tigers fell on the road at Whitman-Hanson. OA goalie Ari Waldorf made 14 saves for the Tigers. Attleboro, 0 @ King Philip, 5 – Final – Cole Ginter didn’t drop a game at first singles, the team of Ryan Gemelli and Sam Collela did the same at first doubles and KP won all five matches in straight sets to beat Attleboro. Ginter won 6-0, 6-0 at first while brother Blake Ginter won 6-1, 6-0 at second singles. Martin Martous won 6-0, 6-1 at third singles for KP. Gemelli and Collela won 6-0, 6-0 at first doubles while Jake Webster and Marco DiStefano won 6-0, 6-1 at second doubles. Canton, 1 @ North Attleboro, 4 – Final – North Attleboro dominated in both doubles matches and took wins at second and third singles to pick up a win over Canton. Senior Barsomo Nuay win 6-2, 6-3 at second singles and junior Alex Rinaldi won 6-1, 6-3 at third singles. The team of senior Daniel Zhang and junior Ben Pfeffer won 6-0, 6-0 at first doubles and senior Andrew Harris and Vikram Senthilakumaran won 6-1, 6-0 at second doubles. Canton junior Jake Wolicki won 6-1, 6-4 at first singles for the Bulldogs’ lone win. Franklin, 5 @ Oliver Ames, 0 – Final – Franklin’s Tony Calderone and Dan Angermeier both made their varsity debuts, teaming up at second doubles and won in straight sets without losing a single game. The pair won 6-0, 6-0 at second doubles while the team of James Johnston and Derek Wu won by the same score at first doubles. Rahul Herur won 6-2, 6-2 at first singles, Eli Brooks won 6-1, 6-1 at second singles and Rohan Herur won 6-0, 6-2 at third singles. North Attleboro, 5 @ Canton, 0 – Final – North Attleboro’s Emily Chiasson and Jordan Willis each won in straight sets without dropping a game to pace the Rocketeers. Chiasson won 6-0, 6-0 at first singles while Willis won with the same score at second singles. Kate Ovoian won 6-3, 6-1 at third singles. The team of Gabby Duva and Azka Siddiq won 6-1, 6-1 at first doubles while Katie Demontigny and Hana Hershey won 6-2, 6-0 at second doubles. Oliver Ames, 2 @ Franklin, 3 – Final – Franklin junior Hailey Strier rallied back after dropping the first set, winning the second set 7-5 and then winning the tiebreaker, 10-8, to secure the win for the Panthers. Franklin also got wins from senior Hannah Sweeney (6-0, 6-0 at first singles) and senior Anja Deric (6-1, 6-3 at second singles). Oliver Ames swept doubles play as Tori Wyman and Kristin Bloumbas won 6-2, 7-5 at first doubles and freshmen Tate Hadges and Maura Kiernan won 6-1, 6-2 at second doubles. Mansfield, 0 @ Taunton, 5 – Final – Taunton won all five matches in straight sets with Jillian Pagliuca taking the win at third singles without losing a game (6-0, 6-0). Olivia Sweeney won 6-4, 6-2 at first singles, Jordan Pagliuca won 6-2, 6-0 at second singles, Emily Moor and Ashleigh Eason won 6-2, 6-4 at first doubles and Callie Herbert and Jordan Martin won 6-2, 6-1 at second doubles. Milford, 3 vs. Nipmuc, 1 – Final – Milford picked up its third win of the season, beating Nipmuc 25-21, 25-20, 16-25, 25-19. Outside hitter Jack Winship had 18 kills and 18 digs, middle Joao Boaventura had 10 kills, 11 digs and four blocks and setter Danny Zwonik finished with 37 assists, a block and an ace. Taunton, 3 vs. Durfee, 1 – Final – The Tigers defended home court with a 25-20, 25-16, 14-25, 25-21 win over the Hilltoppers on Monday. Lens Esquil had eight kills, three blocks and an ace, Lance Law had seven kills, a block and an ace, Collin Hunter added five kills, two blocks and two aces and David Fusiecki had six digs, two blocks, two kills and an ace. Attleboro, 5 @ Stoughton, 14 – Final – Stoughton’s offense exploded for 20 hits with seven players registering at least two hits for the Black Knights. Ruben Gonzalez went 4-for-5 with a triple, three runs and two RBI, Pat Hagerty was 3-for-4 with a pair of doubles, three runs and two RBI and Jack Connelly was 3-for-4 with a run and three RBI. Luke Johnson (double, triple, 3 RBI), Ryan Sullivan and Nick Hardy each had two hits. Justin Hutchinson (3-for-3, 2 RBI) earned the win on the mound, tossing 4.1 innings with four earned runs. The senior struck out 10, including six straight, and scattered three hits. Mansfield, 15 @ Canton, 0 – Final – Mansfield scored in each of the first five innings, including six in the third inning to break the game open. The Hornets connected for 15 hits and reached base on 11 walks. Senior Matt Farragher led the way from the nine hole, going 3-for-4 with four RBI and a run scored, Anthony DeGirolamo went 2-for-5 with three RBI and a run scored, Max Boen was 3-for-5 with two RBI and two runs scored and Zach Peterson had a pair of hits, an RBI and a run scored. Nolan Dousa tossed a complete game shutout to earn the win, striking out six while allowing just three hits and one walk. Foxboro, 1 @ King Philip, 2 – Final – Senior Kyle Guenthner initiated a game-ending 4-3 double play as the Warriors hung on for a 2-1 win over Foxboro. Foxboro loaded the bases in the seventh but Guenthner’s double play helped KP survive. Will Weir wen 2-3 with three stolen bases, scoring both of King Philip’s runs. First, Weir had a two-out single in the first inning, stole both second and third and then scored on an error. Weir scored again in the sixth, connecting on another two-out second, stealing second and then scoring on a single from Ben Furfari. Foxboro had tied the game in the fourth when AJ Bubencik singled, stole second and scored on two passed balls. Sophomore Jack Webster got his first career win, tossing two scoreless innings in relief with just two hits allowed. Junior Jackson Sheibler went 4.1 innings, allowing just one hit and one run and junior Jeremy Rhines got the save with a scoreless seventh inning. Franklin @ Milford – Postponed to Thursday, 4/13 at 3:45. Taunton, 3 @ North Attleboro, 2 – Final – North Attleboro seized the lead with two runs in the bottom of the fifth but Taunton responded, grabbing two runs in the top of the sixth to edge the Rocketeers. The Tigers cashed in on three walks and two hit batters to pushed across the tying and winning run. Taunton’s David Schofield earned the walk to draw in the game-winning run in the top of the sixth. Joe Manchester (1-for-3, run) and Jack Moynihan also had an RBI for Taunton, while Matt Machado had two hits. Moynihan tossed four scoreless innings while striking out five. Danny Keogh earned the win, throwing 2.2 scoreless innings with one strikeout. North Attleboro’s Nate Pearce (3-for-4, double, triple, RBI) allowed just one run in five innings of work. Zach DeMattio added two hits, an RBI and a run and Nick Crawley added a pair of hits for the Rocketeers. 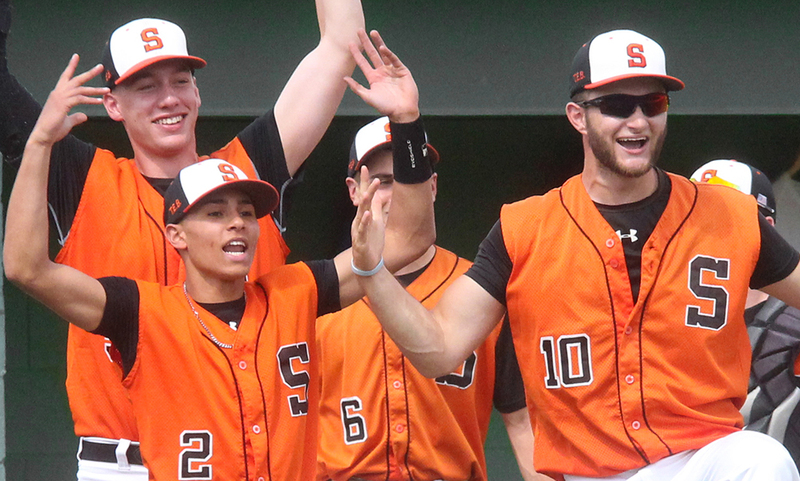 Sharon, 2 @ Oliver Ames, 6 – Final – Oliver Ames got its offense going early, scoring in the first inning for the second straight game and then adding four more runs in the third inning. Junior Mitch Goulet had a pair of hits in the win for the Tigers. Attleboro, 2 @ Stoughton, 1 – Final – McKenzie Bergdoll made an impact both in the circle and at the plate, leading the Bombardiers to a walk-off win over Stoughton. Bergdoll tossed a complete game, scattering six hits while striking out nine. Attleboro was the home team despite the change of venue, giving them the opportunity to bat last. In the bottom of the seventh, Bergdoll connected for a double, driving in MacKenzie Killough (2-for-4) for the winning run. AHS head coach Mark Homer said Jordyn Lako and Ashley Macia had strong games defensively for the Bombardiers. Canton, 7 @ Mansfield, 14 – Final – Megan Letendre pitched a complete game for the Hornets allowing six hits and striking out six batters. She also went 1-for-3 with an RBI at the plate. Kara Bendanillo went 4-for-5 with a pair of RBI and Kerran Holmes went 2-for-3 and drove in four runs for Mansfield. Caty DeMassi had three hits and Hayley McGowan had two for the Hornets. Lillian Carrington and Samantha Keefe each hit a home run for the Bulldogs. Milford @ Franklin – Postponed to Thursday, 4/13 at 3:45. North Attleboro, 1 @ Taunton, 8 – Final – Courtney Fisher picked up the win with a complete game, allowing only one run on six hits, while striking out four. MacKenzie Handrahan powered the offense, going 3-for-3 with three RBI, and Kya Enos chipped in with two hits and two RBI and Katie Van Zandt hit a homer for Taunton. North Attleboro junior Amelia Murphy was 2-for-3 with a double. Sharon @ Oliver Ames – Postponed to a date and time to be announced. Mansfield, 12 @ Attleboro, 5 – Final – Mansfield raced out to a 6-2 lead and kept that pace up in the second half to earn the win over Attleboro. Mansfield junior Hunter Ferreira had his way, scoring eight goals while notching an assist as well. Midfield Joe Cox was a top distributor, recording five assists while finding the back of the net once. Cullen Murphy and Danny DeGirolamo each scored once and had two assists and Sam O’Connell scored once. Sean Powers made nine saves in net for the Hornets. Stoughton @ Canton – Postponed to a date and time to be announced. Oliver Ames, 0 @ Foxboro, 6 – Final – Foxboro goalie Jake Addeche turned away 11 shuts and Pat Stapleton had a strong game on defense with five groundballs as the Warriors blanked Oliver Ames. Foxboro scored three goals in each half, led by Trey Guerini’s two goals and one assist. Sophomore Pete Conley scored once and had two assists while Brendan Tully, Mike Collins and Sam Blake each scored once in the win. North Attleboro, 6 @ Franklin, 7 – Final – Franklin held a 3-2 lead at half, extended it to 7-3 early in the fourth quarter and then held off North Attleboro’s late charge of three straight goals. Franklin goalie Connor O’Rourke had 10 saves and came up big in the final minute as the Panthers held on to their one goal lead. Chase Tanner scored twice and had one assist to lead the Panthers, Kyle McEinry and Packie Watson each scored once and had an assist, Sam Arsenault had a pair of assists and Nitin Chaudhury and Jake Davis each scored once. 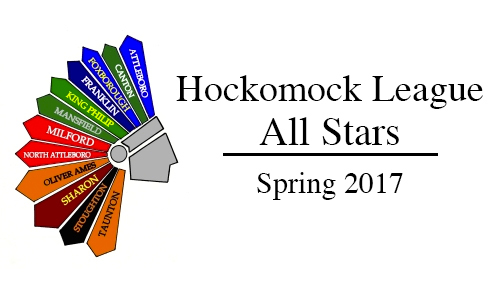 North Attleboro’s Dan MacDonald made 15 saves to keep the Rocketeers in the contest while both Jack Dakin and Zach McGowan scored twice and had one assist. Tommy Lindstrom added a goal and an assist and Nick Moore also found the back of the net for Big Red. Sharon, 6 @ King Philip, 14 – Final – The Warriors opened the season with a win as senior Tim Watson accounted for eight points and classmate Paul Macrina made 13 saves in goal. Watson scored five goals and had three assists while sophomore Colin DeVellis scored twice and had three assists. John DeLuca scored twice and had one assist and Zach D’Amico had one goal, one assist and 11 groundballs for the Warriors. Foxboro, 16 @ Oliver Ames, 4 – Final – Oliver Ames goalie Ari Waldorf made 19 saves for the Tigers while head coach Abby Tepper said Sydney Hedrick had a strong game on defense. North Attleboro, 7 @ Franklin, 13 – Final – North Attleboro took a 4-3 lead into the halftime break but Franklin’s offense came to life with 10 second half goals. Seven different Panthers found the back of the net, led by senior Kendall Reardon’s four goals. Annie Walsh, Erin Walsh and Kelsey MacCallum each scored two goals for Franklin. Freshman Gianna Cameron made nine saves in net while head coach Kristin Igoe Guarino said freshman Alex Field played well defensively and on the draw. King Philip, 13 @ Sharon, 7 – Final – King Philip raced out to a 8-2 lead at halftime and never looked back to open the season with a win over Sharon. Katie Crowther, Meg Wagner and Caroline Klim each scored a pair of goals in the for the Warriors while Alli Meehan, Angela Vellante, Dana Truini, Victoria Tormey and MacKenzie Mazur each scored once. Caroline Watson made 13 saves in net for KP. Taunton, 12 @ Milford, 11 – Final (OT) – Taunton won its second game in a row to start the season thanks to a game-winning overtime goal by eighth grader Alana Tavares, her sixth of the game and 11th in the first two games of her varsity career. Delaney Powell chipped in with three goals for the Tigers and Lorna Li made 12 saves. Emily Hayley had three goals for the Hawks, while Jordyn Lombardo, Taylor Dube, and Jill Burley each had two. Stoughton, 2 @ Attleboro, 3 – Final – Attleboro’s Shawn Gordon and Abdul Khatib each won three set thrillers to help the Bombardiers edge Stoughton and pick up their first win of the season. Shawn Gordon won 4-6, 7-5, 6-1 at first singles and Khatib won 3-6, 6-1, 6-3 at third singles. The team of Eli Araujo and Ryan Gordon picked up a 6-0, 6-4 win at second doubles. Stoughton’s Tony Jordan won 6-1, 6-3 at second singles and the team of Jon Podesta and Erik Anderson won 6-4, 0-6, 6-4 at first doubles. Foxboro, 3 @ King Philip, 2 – Final – Foxboro’s Andre Jabari won the deciding match, winning in a three-set thriller at second singles to help the Warriors edge King Philip. Jabari dropped the first set 6-7 (7-9) but battled back to win the next two 6-3, 6-3 to earn Foxboro the win. Foxboro swept doubles play for its other two points. The team Shawn McNamara and Matt Tierney won 3-6, 6-3, 6-2 at first doubles and Brandon Wasserman and Ben Dorman won 6-4, 6-2 at second doubles. King Philip’s Cole Ginter won 6-1, 6-1 at first singles and Blake Ginter won 6-3, 6-3 at third singles. Milford, 0 @ Franklin, 5 – Final – Franklin picked up a sweep, winning all five matches in straight sets to beat Milford. Rahul Herur won 6-3, 6-4 at first singles, Eli Brooks won 6-3, 6-0 at second singles and Rohan Herur won 6-3, 6-2 at third singles. The team of James Johnston and Derek Wu won 6-0, 6-3 at first doubles and Tyler DiPalma and Rahul Hosdurg paired together for a 6-0, 6-0 win at second doubles. North Attleboro, 5 @ Taunton, 0 – Final – North Attleboro etched its first tally into the win column for 2017 with a sweep on the road at Taunton. Senior Zac Pfeffer won 7-6 (8-6), 6-2 at first singles, senior Dan Zhang won 6-4, 6-2 at second singles and junior Alex Rinaldi won at third singles without dropping game, 6-0, 6-0. Junior Ben Pfeffer and senior Andrew Harris won 6-0, 6-1 at first doubles and senior Mayank Wadekar and sophomore Vikram Senthilakumaran won 6-3, 6-1 at second doubles. Mansfield, 4 @ Canton, 1 – Final – The Hornets of Mansfield took care of singles play, winning all three in straight sets and also grabbed a win in doubles to beat Canton. Paulina Martin won 6-0, 6-1 at first singles, Sarah Doyle took second singles 6-1, 6-0 and Elizabeth Elsner won 6-1, 6-0 at third singles. Mansfield’s fourth win came from the team of Chloe Peters and Tessa Garufi, notching a 6-0, 6-1 victory at first doubles. Canton’s Jenna Paynter and Stelina Michaelidis won 6-1, 6-1 at second doubles. King Philip, 2 @ Foxboro, 3 – Final – Foxboro swept singles play to edge King Philip on Wednesday afternoon. Sophia Prinos won 6-0, 6-1 at first singles, Lexi Nelson didn’t lose a game in a 6-0, 6-0 victory at second singles and Julia Muise won 7-5, 6-1 at third singles to clinch the win for the Warriors. King Philip’s Corrine Palumbo and Carly Adams won 6-4, 6-1 at first doubles and the team of Lucy Barnard and Caitlin Gonser won 6-2, 6-3 at second doubles. Franklin, 3 @ Milford, 2 – Final – Franklin won in straight sets at first and second singles and then used three-set win at second doubles to edge the Scarlet Hawks. Senior Hannah Sweeney didn’t drop a game in a 6-0, 6-0 win at first singles and classmate Anja Deric won 6-1, 6-4 at second doubles. The team of senior Julia Hogan and junior Jillian McLaughlin won the deciding point with a 6-2, 3-6, 6-1 decision at second doubles. Milford’s Caitlin Cafarella won 6-2, 7-6 (7-1) at third singles and the team of seniors Victoria Beyer and Daniella Arojo won 6-2, 6-4 at first doubles. Taunton, 1 @ North Attleboro, 4 – Final – North Attleboro had to claw back at both first singles and first doubles to claim a win over North Attleboro in a rematch of last season’s epic playoff showdown. North’s Emily Chiasson dropped the first set 0-6 but rallied back to win the next two, 6-4, 6-1. The team of Gabby Duva and Azka Siddiq fell behind after losing the first set 2-6, but won a huge tiebreaker 10-8 to win the second set 7-6 and then took the third 6-3. Jordan Willis won 6-1, 6-0 at second singles and the team of Katie Demontigny and Hana Hershey won 6-0, 6-3 at second doubles for Big Red. Taunton’s Jillian Pagliuca won 6-0, 6-2 at third singles for the Tigers. Oliver Ames, 1 @ Sharon, 4 – Final – Sophomore Nupur Shukla and freshman Emily Zhang won in straight sets, at first and second singles respectively, without dropping a game as the Eagles picked up the win. The team of juniors Katie Merport and Emily Wen won 6-0, 6-1 at first doubles and sophomore Sachi Bhasin and Sydney Gordon won 6-0, 6-3 at second doubles. Oliver Ames freshman Maura Kiernan made her varsity debut with a 7-6 (7-5), 6-4 win at third singles. Taunton, 3 @ North Quincy, 0 – Final – Taunton picked up its third straight sweep and second in a row on the road with a 25-14, 25-21, 25-21 win over North Quincy. The Tigers used a balanced attack with Lens Esquil leading the way with 12 kills and three blocks. Malik Charles added six kills and one block, David Fusiecki had six kills and four aces and Collin Hunter had five kills and two blocks.